Three unique library collections and archives sparked my interest this week. Such collections grow slowly and quietly over the years. Here, two are at least seventy years old and one is a fledgling five. The collections described below are maintained by individuals who clearly gain pleasure from their hoarding, and welcome the public to do the same. 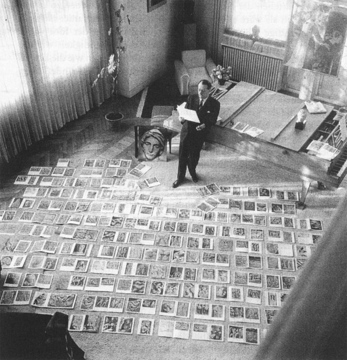 In a well-known photograph from 1950, the French writer Andre Malraux stands before a small sea of images spread before him on his office carpet. His “imaginary museum” remixed the history of art as a virtual collage, one that could be re-ordered at will. “An art book is a museum without walls,” said Malraux, and this statement is writ large, like a rule, on the entry wall of the eighth floor of the Harold Washington Library, in the visual and performing arts division. A visitor to the library’s Picture Collection, located on this floor, could easily recreate Malraux’s style of temporary exhibition. The Picture Collection contains an estimated million-and-a-half images clipped and filed by category. There are over 10,000 subject headings organized alphabetically, for searching or browsing, and the images can be checked out like a book, taken home and pored over. What can you do with images from the Picture Collection? An artist who works in collage, who had a need for vintage images, led me to the collection. He scanned the images and digitally cut and pasted them. The collection’s current keeper, Angela Holtzman, says the images are “terribly underutilized,” but the collection does attract set designers for film and theater who may need to emulate retro designs for a period piece, graphic designers who want to reference old layouts, and students whose teachers make a visit to the collection mandatory for a class project. One such mandatory class visit each semester is made by Marc Fischer’s class, Collections and Archives as Creative Practice, which he teaches as a graduate seminar at Columbia College. Fischer’s students are asked to curate a selection of images from the files. Fischer, whose own creative practice includes the keeping, documenting and presenting of archives, wrote a pamphlet about the Picture Collection in 2003. “Visits to the Picture Collection and a Meeting with Librarian Margaret Gross” is a very good informal history of the unique collection that includes an interview with a librarian, examples of subject headings and pictures of the collection itself. (It can be downloaded for free from publiccollectors.org). I figured that, since 2003, and with the roaring advent of Google image search, things over at the Picture Collection must be different these days. Holtzman assured me that nothing has changed since 1966, when she first started working in the library. She adds to the collection just as her predecessors have. With a team of volunteers she clips pictures from magazines—some are subscribed to for the purpose of gutting, others come as donations, and the Chicago Reader once dumped their photo morgue here. Sometimes a new category needs to be added to reflect our ever-changing visual landscape (“9/11 and its Aftermath”), and others sometimes get adjusted to keep up with contemporary parlance (“Negroes” was changed to “Africans and African Americans”), but no subject ever gets retired or thrown away. Holtzman told me that the quality of printed images is always better than its digital counterpart on the Internet. Re-use of the images in the Picture Collection is protected under fair use copyright law, meaning that one may photocopy the images for personal use, but commercial uses, such as distribution, marketing or sales, are prohibited. Many of the images in the collection are mounted on a card, while others are tightly packed into file folders in the drawers. Some subject categories are what you might expect to find in a collection of images, such as fine art, but there are many surprises: “Baby Sitters,” “Cults,” “Fads,” “Halloween,” “Night Scenes,” “Shopping Centers.” This is the stuff of our popular culture, the day-to-day events we know so intimately that, when singled out and multiplied, become abstract and strange. Holtzman says there’s “no electronic hookup to the collection,” no speedy searchable database. Here, browsing isn’t just a necessity but also part of the fun. Anyone with a curatorial eye will enjoy perusing this compilation of images that’s been in the making for seventy years. Just feet away from the Picture Collection is the Chicago Artist Archive, an identical but smaller bank of black filing cabinets. The Chicago Artist Archive is closed to browsing, as library patrons must request a name or subject and a file is retrieved by a librarian, but the archive is continuously added to and improved upon by public contributors. Any artist who identifies as a Chicagoan can be—and should be—included in the archive. There are resumes, photographs, exhibition histories, press releases, postcards and original works of art sent in by artists and galleries. It’s not a complete history of Chicago art but, in total, is an idiosyncratic slice of the city’s artistic character. N.A.M.E. Gallery has most of their archives here, and one can follow the discovery of Henry Darger’s art and the ensuing battle over its ownership through a trail of press clippings. As part of her exhibition in a case on the eighth floor of the library (a dedicated exhibition space for contemporary art in the library), Anne Stevens asked the librarians if she could have free reign of the archive to read its entire contents—which includes over 9,500 artists—to learn about Chicago art history as a newcomer from Seattle. The librarians agreed, and then Stevens began a new project where she re-presented some of the archive’s material in rotating exhibitions in a glass vitrine. Titled “Open and Free: the Library as Studio,” a selection of ephemera changes every few weeks, and for the final installment Stevens selected a handful of artist obituaries. There’s Lee Godie, “bag lady and respected artist,” dead at 85, but also Irving ‘Bunny’ Dobkin, described by the 1993 headline as “sculptor, exterminator.” These exemplify the diversity of the Chicago Artist Archive and the Chicago art world itself. Stevens is a painter and image-maker. Her secondary creative practice involves digging through archives and making sense of the dearth of collected material. Although her goal is to go through every file, right now she’s interested in a specific aspect of the archive. When the library was housed in what is now the Chicago Cultural Center, the art department presented exhibitions of local artists (just as the Cultural Center does today, but is now overseen by the Department of Cultural Affairs). Most artists who had shows in the library during those years (from the mid-1940s through 1975) had their information added to the archive. Sometimes, with artists who did not follow a traditional art career, their presence in the archive is most of what remains. Stevens is trying to make tangible the history of these artists, the unknowns. Stevens’ art on view is related to her digging adventure through the archive. The primary imagery shows a lone parachutist falling through a colorful void. It symbolizes the fragility of a life lived in too hot pursuit of art, the leap into the unknown, and the safety net of something like a public archive, which will remain here, protected, as long as the library stays open. Artists interested in having their careers included in the archive can contact Leslie Patterson, art@chicagopubliclibrary.org. “Open and Free: the Library as Studio” runs through the end of October. In Hyde Park, a library-slash-archive from Brooklyn has opened for browsing. The Reanimation Library, founded and operated by Andrew Beccone, is a non-circulating collection of books on any subject (though not typically fine art) that contain large amounts of visual information, from instruction manuals with diagrams to cookbooks with retro dishes. Most if not all of these books are no longer in mainstream circulation, their content long out of date and not useful to modern readers. Beccone expects that readers may be entertained by the accidental nostalgia of the texts, but his major interest is the imagery that, if the books were simply discarded, would also be lost. Beccone asks users of the Reanimation Library to make photocopies of the pages and use them at will. Unlike a Picture Collection, where images are clipped and divorced from their original contexts, these images remain buffered by the authors’ ideas, even if they are occasionally obsolete. Beccone calls this a “multi-dimensional experience.” For the fourth temporary branch of the library, Beccone selected forty-eight books to be on view and available for the “harvesting” of images. Titles include “Stomach Ulvers” by Sir Cecil Wakeley, M.D., “Starting right with Milk Goats,” by Helen Walsh, and “Birds as Individuals,” by Len Howard. More than being just banks of strange imagery, the collected books reflect, like any archive, the outmoded character of a bygone era (and, by proxy, the archivist’s). Beccone enjoys a book with “encoded attitudes,” and the more encoded the better. Though most of these books were written and illustrated with the intention of giving shape to knowledge, some of them, yellowed and dusty, are like the illustrated manuscripts from the Middle Ages, remnants and apparitions of defunct lives once lived in the pursuit of meaning. People may use the Reanimation Library for research or for art, whatever they please. While Beccone the librarian is not always privy to how the materials get used, he says that “the library is also my art project,” such that he sets up the opportunity for discreet collaborations with strangers. The Hyde Park branch of the Reanimation Library is open through November 13 at DOVA Temporary, 5228 South Harper.